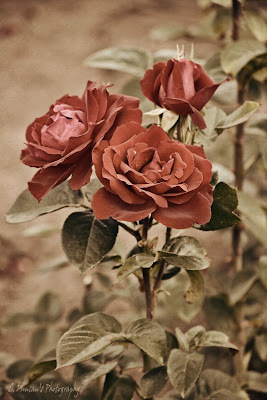 ...Photographic Ramblings...: Vintage Roses ~ Floral Friday! Friday once again, and that means flowers here at the blog. I've had a week free of any work, which means you seen some photos manipulated, played with or just were wonky enough on their own straight out of camera. Just because it was fun to do so! Today's image is brought to you by the letter R... wait... sorry, mild flashbacks of Sesame Street, ahem. Today's image provoked me to edit with something aged in mind once again. Sepia shots of old rose gardens with some hand tinting came to mind for this one. Taken in the right light, roses have this lovely crisp texture to them so I was dying to try finding something to compliment that in editing. I found it when I used a duplicate layer to add a sepia conversion and used curves on the same layer to pop the mid tones and highlights. I dropped the opacity on that duplicate till I liked how much color showed through for effect. Another layer was applied with a textured old canvas effect, and I used the eraser tool to soften and remove some of it especially around the roses. Layers were flattened, and a bit of high pass sharpen applied at the hard setting which suited the overall look. I think I may have to print this one as a canvas... makes me think of some of the old postcards that my grandmother collected way back in the day. And I think I may do a series for cards, which will finally be going up on the website for ordering within the week. Thanks for the Friday ramble... get out there and capture your vision folks!